We aim to make the best bread in the world. I know.. that’s a high bar. But why not? Our flour is fresh and beautiful, and our hands are gentle and experienced. We study everyday to understand our bread. We do our level best to make our bread, your bread, fabulous. But what KINDS of bread do we bake? We bake MANY different kinds of bread (our current count is around 200 different loaves), and every week we bake a widely varied selection. Peruse the gallery and descriptions below to learn about a few of the breads we bake most often! Country bread from YOUR country. Our bread, Your bread. Light rye sourdough studded with sunflower seeds and rolled in poppy, sesame, and sunflower seeds. Hearty, nutty, nourishing: seriously delicious. Deep, dark, dense, and delicious. German-style whole rye sourdough, made with all local organic rye flour. Slice it think and spread it with butter to understand true bliss. Classic French-style sourdough. Not sour-sour, like so many "sourdough" breads, ours is complex and enlightening. Look for aromas of apple, pear, hazelnuts, wheat, and a high-note of lactic and acetic acid. The king of breads. A nutty, mild sourdough with great texture and mouthfeel. Mostly local sifted wheat flour, with local polenta. Our house bread! Milk local, wheat sourdough with toasted wheat germ and oat bran incorporated into the crumb. A splash of olive oil gives it toothsome texture. 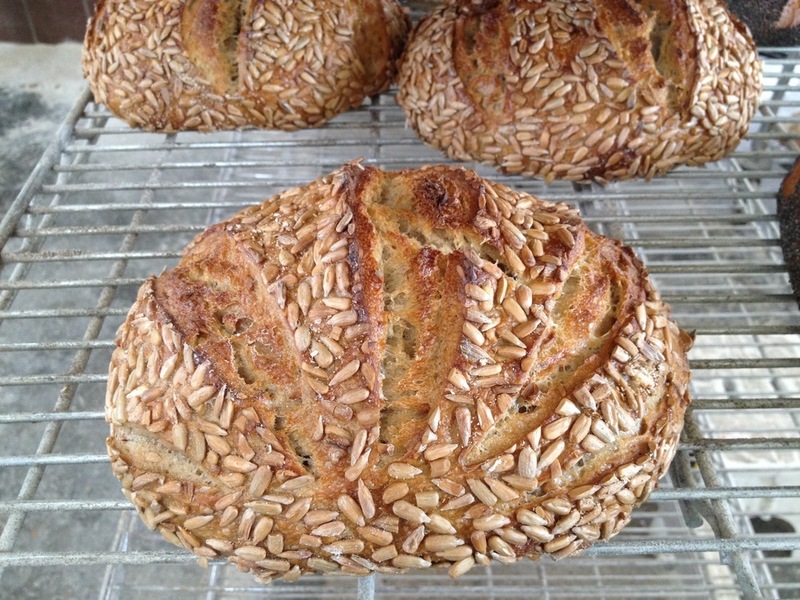 Local whole rye and wheat with caraway and sesame seeds. This is what it’s supposed to taste like. No joke. Crisp crust and an open, moist crumb. Easy to love. 100% organic white bread flour, yeasted.